While I would prefer that contemporary country artis ts stop looking to the pop-rock music of the mid-1980s for their primary influences, I can at least credit Eli Young Band’s relative good taste. Other A-list groups may aspire to the MOR sounds of Air Supply and REO Speedwagon, but Eli Young Band’s “Even if It Breaks Your Heart” tips its hand to the Replacements and Paul Westerberg. Which is to say that at least they’re trying to sound like a very good band instead of an awful one, so they’ve handily cleared a bar that their peers have set just a few scant inches off the ground. As a cover of singer-songwriter Will Hoge’s single from a couple of years back, “Even if It Breaks Your Heart” is to-the-note faithful to the original arrangement and to its homage to all of the things the Replacements did well: The electric guitar power-chords are heavy and carry just a hint of distortion, giving the track a sturdy rock wash that can’t entirely mask how much the melody and construction owe to classic pop conventions. What that has to do with classic country conventions is another matter entirely, but, considering how few singles on country radio at the moment have a memorable melody or show any real regard for how to structure a hook, “Even if It Breaks Your Heart” does get a few important things right. Lead singer Mike Eli, for his part, sings the song with as much conviction as he can muster. The natural rasp in Hoge’s voice brought a greater sense of gravity to his performance than Eli can pull off, but he makes a game effort to sell the song’s familiar narrative. As yet another testament to dues-paying and big dreams, “Even if It Breaks Your Heart” is fine enough, but “Chasin’ That Neon Rainbow,” it ain’t. So it’s a matter of good but not great song, given a credible performance by a competent band with the wherewithal not to want to sound like Journey. While that, regrettably enough, might actually make for one of the year’s standout country singles, “Even if It Breaks Your Heart” is undermined by its frankly terrible engineering. Eli Young Band were on the losing side of the Loudness War in the recording of their track: Precious few guitar chords in the full duration of the performance actually ring to the full breadth of their tone, giving the single a clipped, tinny sound. Just as there’s no excusing the poor taste of so many of today’s country artists, there’s no excuse, given the available technology, for a single to sound as bad as this. Written by Will Hoge and Eric Paslay. Really terrific review, right down to the engineering whack job. The Will Hoge version is one of my favorite tracks of the last several years, largely because of the raspy vocal – how it adds to the song’s sense of history, and how it contrasts with the smoothness of the melody. Without that, the song’s plainness is more obvious, and the way Eli has tweaked the verse melody removes some more of its color. But I still like it all right, and it’ll certainly stand out on the radio. So basically what you said. …poor mastering at this day and age, when you can make blockbuster-movies out of cartoons starring shape-changing trucks, cars and other vehicles. who would have thought that was possible – the mastering blunder, i mean. as for the song – it’s sounds good in a poor way. the eli young band displays their signature sound – again in poor way – just the way i and probably most of their fans like it. of course, it ain’t remotely country, but what the heck, you can’t expect music that left the honky tonks for big arenas some time ago to sound very similar still, can you. A lot of country fans of today grew up on 1980s pop music so I think it makes a lot of sense for today’s country singers to find inspiration in 1980s pop. Sweetcheeks. The song was written by Will Hoge and Eric Paslay, originally recorded by Hoge. The single is heavily influenced by 80s pop-rock, but it wasn’t written or performed by an 80s act. Must have stuck in my head from his performance opening for the Pistol Annies. 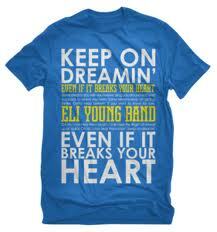 I KNEW when I heard The Eli Young version that it was a remake. Anyone know why Will always chews gum when singing?? lol I found it to be a bit distracting. He has a great raspy voice though, wish I would have been at House of Blues when he sang with Fogherty.